I had a sudden urge to do some more card making not long before my baby was due, but as I wasn't going to have the time/ energy/ ability to lift heavy boxes and keep bending down, I decided to indulge myself but only use things that were easily accessible from my craft stash, either at the front of the cupboard or not needing any special equipment or effort! It was a good opportunity to use up some of my stash, for example these die-cut butterflies I bought from ebay absolutely ages ago. I received a large packet of different coloured die-cut butterfly shapes and had used them before but there were a lot left. 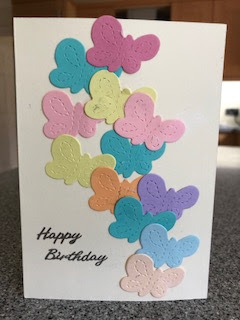 The colours made me think of spring so I decided to make a clean and simple (CAS) card for a friend with a birthday in March, letting the butterflies take centre stage. The way I've arranged them makes me think of a whole swarm of butterflies taking flight en masse - and the card didn't really need anything else other than a 'happy birthday' sentiment. I'm sharing this with Cuttlebug Mania, a challenge to use die cuts where the theme this time is spring, and the Sparkles Forum Challenge where 'spring is in the air'.